made of very good quality plated silver so will fit most wrist sizes. They all come in silver card gift boxes. 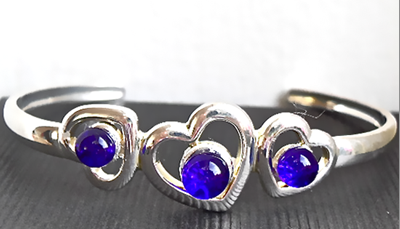 A very pretty feminine smaller bangle with three hearts and Cobalt Blue glass pieces. 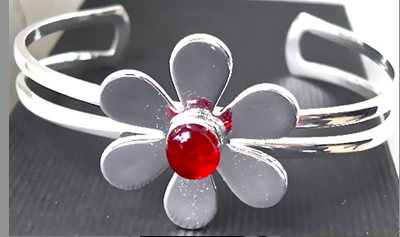 A very pretty bangle with a six petal flower design with a small clear Red glass decoration. 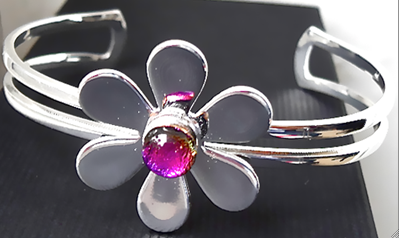 A very pretty bangle with a six petal flower design with a small Magenta glass decoration. 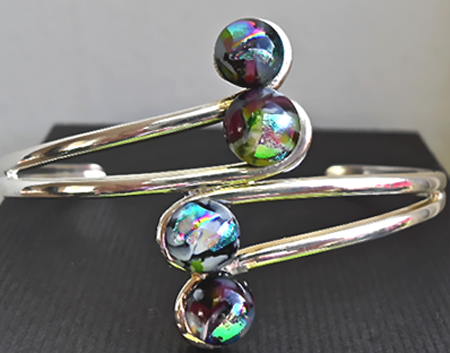 A very pretty quite delicate looking bangle with four multicoloured Dichroic pieces set into an adjustable silver plated bangle. 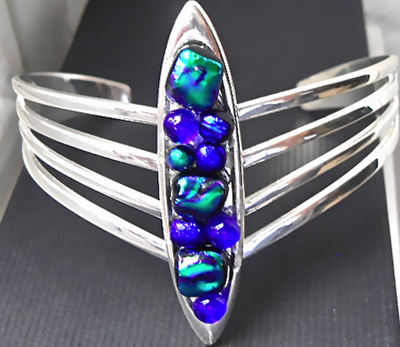 This bangle will fit up to a 16cm wrist and is not adjustable. 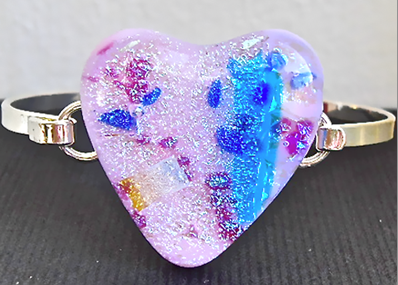 It has a very pretty pale pink heart with multi coloured pieces of Dichroic accents. It will fit smaller wrists. 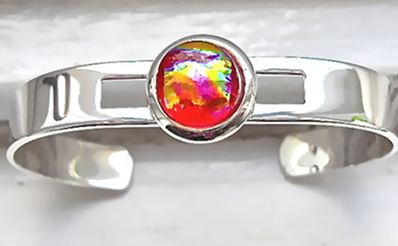 A very elegant classic shaped silver plated bangle with a Red/Rainbow Dichroic glass piece set into it. 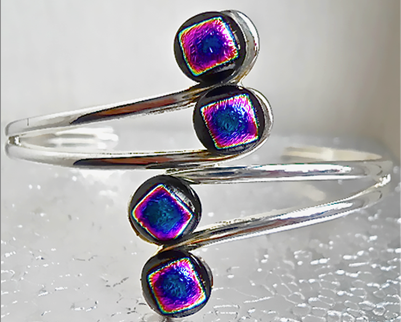 A pretty bangle with four Turquoise and rainbow coloured Dichroic glass pieces set into an adjustable silver plated bangle. 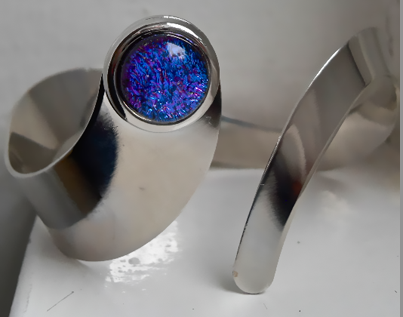 A very pretty bangle. It's a mixture of Lilac and Turquoise Dichroic glass. 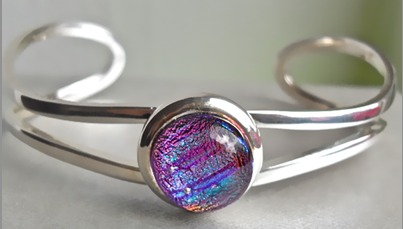 A very pretty quite delicate looking bangle with four Purple/Magenta and Black Dichroic pieces set into an adjustable silver plated bangle. 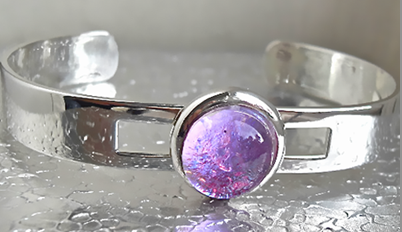 A very elegant classic shaped silver plated bangle with a pale Lilac/Blue Dichroic glass piece set into it. They have matching stud earrings. 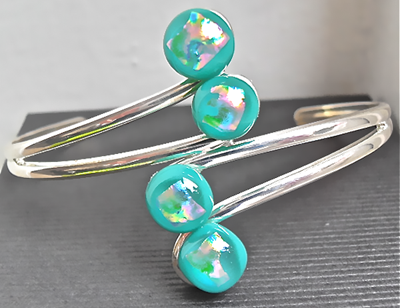 This small bangle will fit up to a 16cm wrist and is not adjustable. 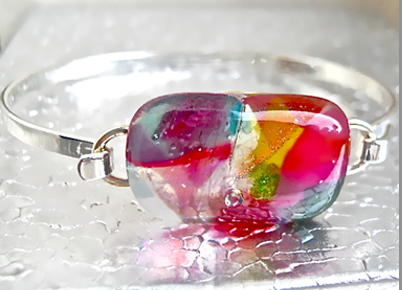 The glass piece is made of Pink/Yellow/Green Dichroic glass on a Silver base. 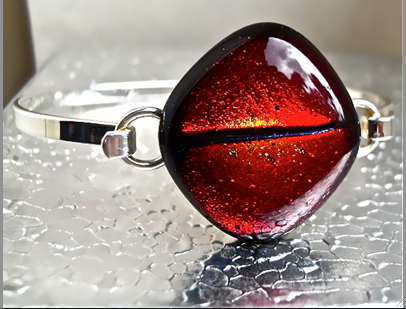 This bangle has a dark Red cats eye effect Dichroic glass piece on a smaller plated silver bangle. It's more suitabe for smaller wrists. A very unusual bangle. It has pieces of Cobalt Blue and Dark green dichroic glass. Another new design. 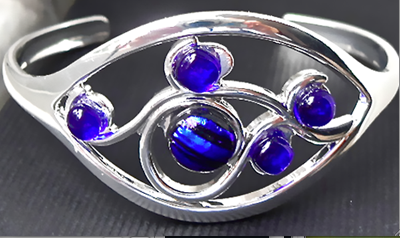 This is a pretty delicate looking bangle with five pieces of Cobalt Blue glass set into a flowery design. 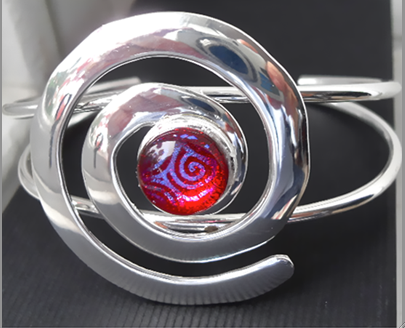 A very dramatic looking bangle with a large silver swirl which has a lovely Dark Pink/Blue patterned Dichroic glass piece. Another new design. 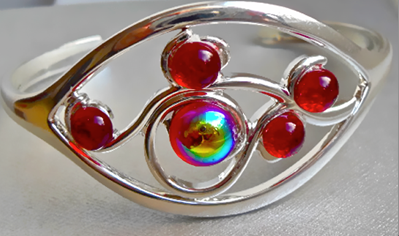 This is a pretty delicate looking bangle with four small pieces of bright Red glass and a larger piece of Red glass with a Gold/Green centre set into a flowery design. This large very shiny snake bangle is Rhodium plated and quite a statement piece. It has a Bright Blue / Purple piece of Dichroic glass.